i have attached a doc file it contain a detail info about the problem to be solved. I created the following applet. It is similar to what you want. You can change initial positions with different initialization code and add rules for your game. You can drag from the center of the blue particle to change it's velocity when it is in paused state. The blue particle will start to move when you release the mouse. You can change the friction coefficient mu and elastic coefficient k.
k=1 means elastic collision without energy. k<1 then energy is loss due to collision. Because the particle move in the same direction when there is no collision. The energy loss is where d is the distance traveled. d can be calculated between each time step. And kinetic energy will be loss due to friction. So I re-calculate velocity after each time step. And if the right hand side become smaller than zero, it means that the particle should have been stopped. (So velocity has to be set to zero). I think I should only help you from the physics point of view. The rest work should be your job, waiting for you to finish it. I will be glad to help you if you have questions related to physics! Thank you for your help and guidance. I'll soon complete the project and inform you. Thank you again and I really appreciate your work. The time step dt need to be smaller enough (which is depend on velocity V and diameter of the ball R). V*dt<< R (　dt<0.1*R/V should be fine). 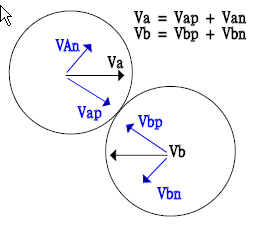 If V*dt ≒ R , the approximation used in the calculation (finding the time collision really occurred) is not valid. So you should adjust time step (or set maximum value for V) to satisfy the above condition. When m1 = m2, is it normal that the sum of the speed of the 2 balls does not remain constant over time? Velocity is a vector which is not the same a speed! Please note that I modified the code in my routines now such as to work for (partially) inelastic collisions as well. This was simply achieved by subtracting the velocity of the center of mass from the final velocities for the elastic collision case, multiplying this by the restitution coefficient (which is an additional input parameter) and adding the velocity of the center of mass on again. why we need vb1 and vb2 ?? and also what is your means by undo projection..
actually sir i am doing work on molecular dynamics in gas and when particals are collide we use your model of 2d collision is this correct for us to use these equations at the time of collision ?? In the real world, time move continuously. However, we can not do the calculation continuously. It is always a finite time step (no matter how small it might be). The time step dt is the same during the simulation. However, collision often occurred in between time steps (between time t to t+dt). We tried to detect if two object overlap each to know colllision should have occurred. Then, we need to find the exact time when collision occurred. If this 2D collision, we use an approximation method to find the time when collision occurred. Support the rasius of two particles are r1 and r2, and the distance between two center is d.
then we move back time step ddt=(d-(r1+r2))/vp to find the time collision occurred. After we take care of collision, we need to move time forward ddt again. We tried to detect if two object overlap each to know collision should have occurred. Support the radius of two particles are r1 and r2, and the distance between two center is d.
This is a computational logic that i only appreciated and understood after using Ejs to make simulations, because i was trying to do the same thing. "detect if two object overlap each to know collision should have occurred." In Ejs i think it is called Event Handlers. If you do not believe that the bounding box collision would be good for your preflight you should try the circle of its bounding box .. then it really does not matter. Check two circles overlap is much easier to see, too, at least in my opinion. The above code works under the following assumption: v*dt<< R, where R is the radius of the ball. It means that the time step need to be chose properly. and I tried the java programs you provide, tenth the collision happened. I wonder where I made a mistake? I have some problems to manage 3D Collisions!!! I try to transform this 2D collision detection into 3d collision detection, but I have some problems to compute the dt!!! Anyone has some simple ideas to transform this 2d collision to 3d collision detection? Please write down how you did it in detail so that we can discuss it base on your calculation. The required condition is where is the radius of the ball. I tryed to use the polar coordinates to manage this problem in 3D. I do not understand the way you defined those angle? I would suggest you use (x,y,z) coordinate. Assume and are center of those two balls. And the radius are . Let which is the relative vector between two centers. Just add one more component (z) if you want to transfer from 2D(x,y)to 3D(x,y,z). It will be much easier if understand the meaning of inner product between two vectors- Help you find out projection of one vector into another vector. Thank you very much, but I still have a problem. There is any error in my code? Normally, NaN came from divided by zero or negative value inside sqrt root, etc. The program should be able to provide the line number where the error occurs. Find out the code which produce the error. What dictates the direction of the normal vector? While i understand that it's perpendicular to the angle of collision(AoC), what determines whether its AoC+PI/2 or AoC-PI/2? It does not matter as long as you use the same vector to convert normal component and parallel component back to final velocity after collision. That is the beauty of vector analysis! You can try it with either one, and you will find out that you will get the same result. Sir, I'm implementing 2d collision on objective - c using opengl. but it didn't work . if i didn't calculate and apply dt to ball 1 position (translation) , the ball is stuck together (but it is moving) . but if i apply dt, the ball seems going messy when collideed. can you see what is going on with the code? the variable dt can be minus when check through console, is it right? CGFloat dt = (r1+r2-d)/(vp1-vp2);// the collision should have occurred at t-dt (Actually this is also an approximation). //Because we have move time backward dt, we need to move time forward dt. The problem could be due to the parameters used in the simulation. The above model of calculation assume: the time step is small enough so that the distance move in each time step is smaller than the radius of both particles. The problem you found much be due to the time step is too large or the velocity is too large. 1. r1 and r2 are about the same or similar order. Make the velocity smaller or change the time step to smaller value. May be you are updating the view 60frame per second. You can make the time step 1/600 second, and update the view every 10 second. So it is up to you to change the time step to any suitable precision you want. Sir, why the dt can be result of nan? what can cause that? how to solve it? and i found that when ball1 collideed with ball2 with mass1/mass2 = 1.0, velocity x ball1 200 , velocity x ball 2 -100 (moving opposite) and ed = 0.8, ball1 didn't bounce a bit, instead ball1 just moving forward.